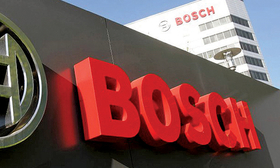 Robert Bosch is the largest global supplier. *Estimate ~Fiscal year **Adient spun off from Johnson Controls on Oct. 31, 2016, to become an independent company. Global vehicle production may be leveling off, but the fledgling market for self-driving car components is already morphing into suppliers' next gold rush. In 2020, automakers are expected to produce 85.9 million vehicles equipped with collision-avoidance systems, up from 10.8 million last year, according to Gartner Research. That's eye-popping growth in an industry where it was beginning to look like the decade's roaring business cycle was nearing its end. And it explains why companies such as Bosch, Continental and Autoliv — the mega-suppliers that dominate the Automotive News list of the top 100 global suppliers — are promoting their ability to integrate the necessary array of sensors, computer chips and software. "Revenue is growing extremely fast," Mike Ramsey, a Gartner analyst in Detroit, said of the emergence of autonomous technologies. And the trend favors mega-suppliers, "who are best positioned to take advantage." That's because they enjoy economies of scale, deep pockets for product development and long-standing relationships with automakers, Ramsey said. "If they don't deliver, the automakers can wring money out of them without putting them out of business," Ramsey said. "The automakers feel a lot of security dealing with the big suppliers." Since r&d costs are considerable, the world's largest mega-suppliers hope to make the new technologies competitive by exploiting economies of scale. Bosch, the No. 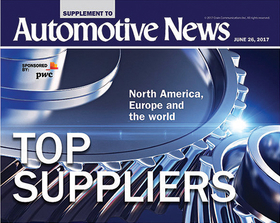 1 company on Automotive News' top suppliers list, with $46.50 billion in original equipment sales in 2016, generates annual sales of more than 1 billion euros ($1.12 billion) for the sensors, software and actuators needed for collision avoidance and self-driving vehicles. Now the company is upping the ante. In May, Bosch announced it will spend $336 million over the next five years to develop artificial intelligence for self-driving vehicles. But even a behemoth such as Bosch is relying on newly formed partnerships to fill gaps in its menu of technologies rather than rushing into the new world alone. In April, Bosch formed an alliance with Daimler AG to produce a fleet of driverless taxis. The company also has announced plans to manufacture vehicle processors with Silicon Valley's Nvidia and is working with digital mapmaker HERE to develop crowdsourced road maps. The task of designing self-driving vehicles "is too big for one company alone," said Kay Stepper, Bosch's vice president of automated driving. "We need the partnerships." While Bosch is forming partnerships to gain access to key technologies, other companies are making acquisitions, and some of the deals have been blockbusters. ZF Friedrichshafen — ranked No. 2 globally, with 2016 original-equipment parts sales of $38.47 billion — roiled competitors in 2014 with the $12.4 billion acquisition of TRW Automotive, a key producer of radar, cameras and brakes. Last year, chipmaker Qualcomm Inc. disclosed a $38 billion bid for NXP Semiconductors, the auto industry's top supplier of semiconductors. And this year, Intel Corp. announced the $15.3 billion takeover of Mobileye NV, the top producer of obstacle-detection software. In all three cases, the bidders sought instant status in a key new technology. In this market, patience is not a virtue. Large suppliers also have scrambled to acquire smaller companies — often Silicon Valley startups — to fill gaps in their technology portfolios. In 2015, Delphi Automotive (No. 12, with $16.66 billion in global sales) bought Otto- matika Inc., a Pittsburgh supplier of automated-driving software. The same year, Delphi invested in Quanergy, a startup developing solid-state lidar. And this year, Delphi partnered with two Israeli firms and a German company that specialize in technology for cloud connectivity. Delphi is marketing itself as a company that can integrate a customer's sensors, software and computer chips required for self-driving cars. Other companies are taking the same approach. Fully automated vehicles won't hit the market until next decade, but sales of their core technologies — such as radar, cameras and obstacle-detection software — are booming. That has been a windfall for Autoliv Inc., the world's top airbag producer, and also a major supplier of radar and cameras. Autoliv's active safety electronics division reported sales of $740 million last year, up 17 percent from 2015. The company expects sales will grow 15 percent annually through 2020. That's a nice boost for Autoliv — which ranks 22nd with sales of $10.07 billion — because it is occurring at a time when the airbag market has matured through saturation. The key to Autoliv's strategy is Zenuity, the company's newly formed joint venture with Volvo Car Corp. that will develop the decision-making software that allows self-driving cars to plot their course. The partnership hopes to have its software production-ready in 2019, which means a customer could put it on the road in 2021. Zenuity is important to Autoliv's goal of designing decision-making software that can be used with any supplier's sensors, actuators and control units — not just Autoliv's hardware, said Johan Lofvenholm, president of Autoliv Electronics. "Zenuity is a software-only venture," Lofven-holm said. "We have to make a system that is 'hardware agnostic' so that we can make sure we have maximum versatility for customers." To be sure, Autoliv and other mega-suppliers have made a big bet on a technology that is a decade from mass-market acceptance. But that doesn't bother Lofvenholm. Autoliv has spent decades designing components that protect passengers from injury. The next step — autonomous vehicles — ultimately will prevent accidents from occurring. "Autonomous driving is the logical next step," he said. "That's how we are approaching this whole segment."